Just getting started on writing an essay takes a big effort for many kids (and adults), so it’s no wonder that once they put the period after the final sentence, students can be reluctant to make any changes. Revising, in other words, is a challenge – both to do and to teach! 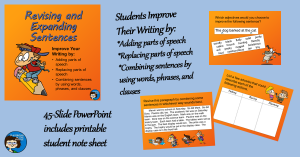 To make the process a little less painful, students can practice on bits of text that are not their own before they tackle the revising step of the writing process with their own creation. And they can start small; revising single sentences or single, short paragraphs works fine for practicing specific revision skills. 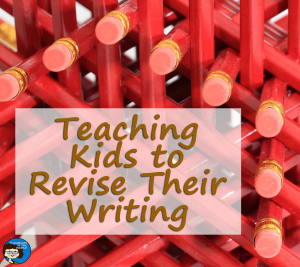 Then, once kids have tried out various revising techniques, they can apply them to a longer passage and finally to their own writing. There are many ways to revise. 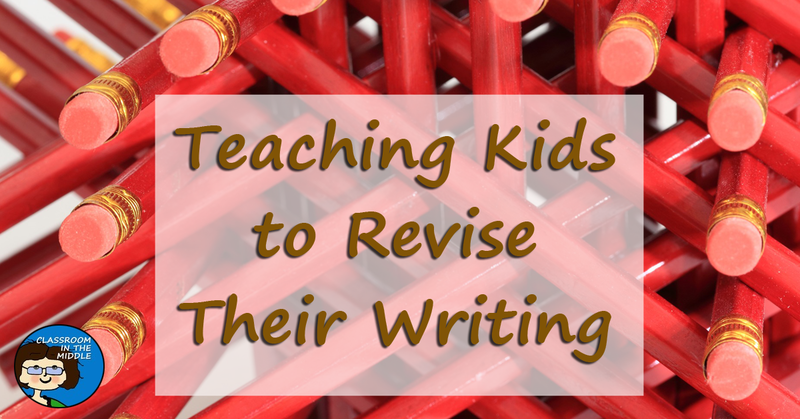 Here are a few of the specific techniques that can help students make meaningful revisions to improve their own writing. Each technique can be practiced on its own and then later applied to other writings. These are some of the techniques that I’ve incorporated into my teaching resources for revising and the writing process. Students can add more facts to an informational essay, or they can add more descriptive details to a narrative story. They can add adjectives and descriptive phrases to give their readers a visual image of what they are describing. This is a good, basic place to start, especially since students are just adding to, not erasing from, the drafts they worked so hard on. Sometimes, you do have to erase! Students can look for repetitive words to delete, and they can also look for sentences that might be off topic to get rid of. Students can replace often-repeated nouns with pronouns to vary their writing, too. On their first try, students probably used a number of very common words – the first ones that came to mind. That just makes sense, but now is the time to sort those words out and replace them with better ones. Students can identify commonly used words in a paragraph and then replace each one with a more specific or more interesting one. Kids often use a thesaurus for this activity, but they’ll need to practice choosing a word that really fits the context of their writing from the the many synonyms that a thesaurus offers. You might want to work on one part of speech at a time here, such as by replacing boring verbs with more vivid ones, or replacing common adjectives with unusual and interesting ones. 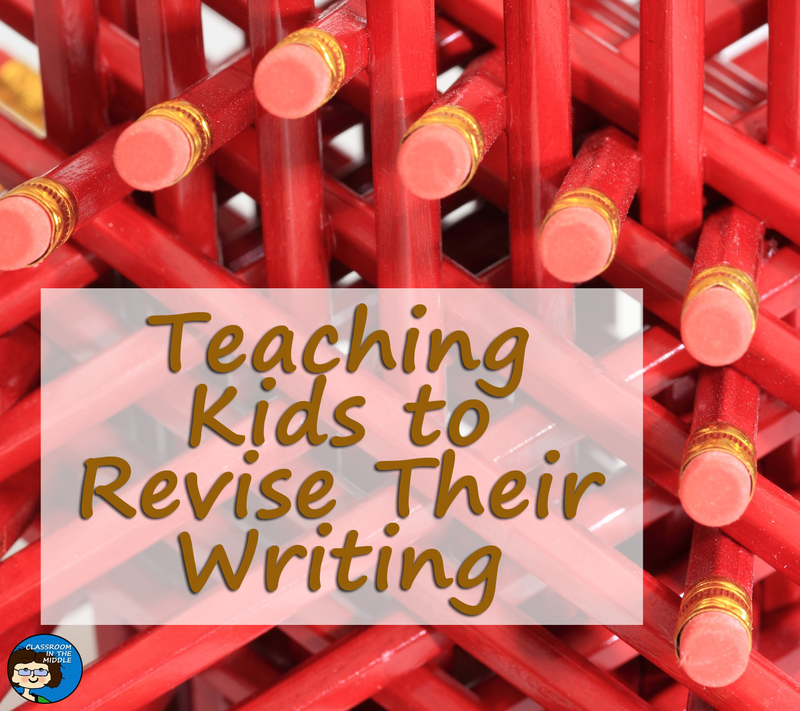 Some kids in the middle grades are ready to move on from the basics with their revising. Changing the point of view is a more challenging activity for students who are ready to tackle it. Students rewrite a passage from the first person to the third person,or vice versa. This is another more challenging activity. Students can try rewriting a passage from past to present tense, or from present to past. As with the POV activity, they’ll probably see that they want to make other changes along the way as well. Writing dialog can get complicated, but it can also be a fun activity for any students. Working together in groups, students could rewrite a scene from a story that they read in class as a play or skit to practice writing dialog. Later, they can use quotation marks and speaker tabs to incorporate lines of dialog into a story. At the simplest level, students combine short, choppy sentences into longer ones using coordinating conjunctions. For more of a challenge, use subordinating conjunctions and dependent clauses. Demonstrating on a few sample paragraphs with various subordinating conjunctions will give students a clearer idea of where they’re going with this. 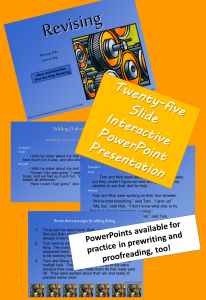 My Revising PowerPoint introduces this step of the writing process in detail and presents practice examples so that students can start practicing each of the skills as they learn about them. In my Revising and Expanding Sentences resource, I focus on revising with individual parts of speech first and then move on to revising with phrases, independent clauses, and dependent clauses. If you’d like more information about either of these resources, follow the links to see the previews or to read more about them. Next time, I’ll post about some more of my revising resources, including my latest – Revising Task Cards.